State Of The Art-s-s-s: When Is ‘Perfect’ The Enemy Of Good Enough’? This week, I attended a Pittsburgh Society of Illustrators business meeting on the techniques of digital illustration.The presenters were several of my fellow illustrators, each specializing in a different area of our industry; editorial, technical, and medical illustration. I couldn’t help but be impressed with their talent, tech savvy and sense of adventure as they demonstrated many of the new digital devices and techniques available to us illustrators. Still, the evening had awakened the old beast of doubt in me, turning up the volume on many issues, even considering my long freelance illustration career. I’ve been working ‘tra-digitally’ (a blend of traditional drawing/painting with digital enhancement) for a number of years but came to this approach slowly as I grew more familiar with design software and accepted its promise of production efficiency. What I couldn’t anticipate was the seductiveness of a process that, like coffee, has since become a daily necessity for me as I produce assignment work for clients and publish my own books. In fact, my use of digital techniques seems to be overriding my love for the unpredictable results and sensual feel of pen, pencil and/or watercolor on paper. Moreover, for better or worse, it has changed the way I think about and ultimately set down an image before declaring it finished. Though I’ve become accustomed to exercising the endless options of digital ‘tweak-ability’, I now understand that these very options have caused a breach in my self-confidence when I must revert to drawing an image on paper for purposes other than print reproduction such as commissioned portrait. Where once I was easily satisfied by the look and feel of my early creative efforts, I now automatically examine my work for ‘irregularities or imperfections’ that can be ‘fixed’ with Photoshop instead of appreciating those expressions for what they are; manifestations of my imperfect human creativity. With that thought, the question in the title of this essay, (‘when is ‘perfect’ the enemy of good enough’?) comes into play. Because it is becoming increasingly difficult to decide when an image is finished, the simple answer is ‘always’. I’ve often wondered whether working this way causes me to overthink my work, questioning its ‘rightness’ even as I embellish it with seemingly relevant images and stylistic details to the point where its core story or idea is obscured. At such times, when I become obsessed with locating just the ‘right’ reference image or am impatient with the complexity of creating or digitally editing an illustration for print, those who have known me and my work for many years often remind me that I actually seemed more efficient when I produced my art traditionally from my imagination without the aid of digital software. They are probably right. With assignment work, I must consider my client’s requests concerning an illustration’s political and/or social ramifications. This often leads to extensive editing or discarding the image altogether. If I choose to retain the image, it sometimes has to be stripped down to its simplest form to satisfy the requirements of the assignment. This always precludes it from revealing the marks of my thinking/working process. Additionally, I am required to design and size my images so they may be set within a pre-determined space. Certainly I’ve had to adapt to the tenets of graphic design which embraces the elegant expression of visual splash or memes as powerful as a Twitter ‘tweet’ for instant consumption as opposed to the detailed storytelling subtleties expected of traditional illustration. Is this a good thing? I’m not entirely sure. Yes, it forces the eye and mind to focus on the ‘message’ but perhaps something of its original concept’s character and intent has been lost in translation. I have to admit that I do enjoy a major benefit of digitally preparing my illustrations; it grants me more control over my finished printed product as opposed to the old mechanical methods where I had to depend on others for my desired outcome. Although the new products are now able to simulate every known drawing and painting technique and have enabled me to become a ‘one-stop design shop, I still have questions. If I go totally digital with my art, will I be able to shed my prejudice against creating images on a glass surface that is less sensually direct than paper or canvas? And, should it matter anymore whether I no longer have a frame-able, completely ‘original’ work of art as ‘evidence’ of my efforts? One presenter at the meeting proudly proclaimed that he’d fully embraced digital illustration and had ‘gotten over’ his need for original tangible art products. Having appreciated the beauty and intense craftsmanship of his original works, I could, from a pragmatic standpoint, understand why he might have felt that way. Corporate art collections have diminished over the last few decades while museums and most galleries rarely offer highly promoted exhibits to lesser known artists, preferring to host more profitable exhibits by either box office name artists or long-dead old masters. In addition, many galleries have upped sales commissions to sometimes more than 50%. The internet has also become a formidable rival to brick and mortar exhibit spaces. It offers an enormous marketplace with affordable entry fees that is overwhelmingly democratic for all creators. So we don’t really depend on exposure through museums and galleries anymore for our livelihood. For this reason, I don’t even carry around a weighty portfolio when I can post my work to potential clients and collectors on social media. Historically, the disciplines of illustration and graphic design have worked together for both print and digital media. Now, I suspect that the internet (beneficial to our business as it is) is also a great disrupter. With its endless cacophony of sensational news, information, music and images it has of necessity rendered graphic design the dominant force over illustration in order to accommodate our tragically dwindling attention span and capacity for remembering things. From this perspective, I suppose I should be discouraged from pursuing my craft in the manner I’ve been trained to do; creating illustrations that intrigue the eye and mind on multiple levels with traditional materials. Of course I can still make intricate images with digital assist but they will appear obscure beside the flashy visual memes that are our current brain candy. It’s been said that great art reflects the era in which it was made, yet the artist in me refuses to cave. My illustrations and drawings will inevitably emerge as they must because of the question that nips at my conscience; will today’s visual flash preserve and continue to tell future generations the myriad complex stories of who and what we once were or will they require an entire field of scholarship to create a new Rosetta Stone? A Blessing For Dressing: Are You What You Wear? Just as our skin conceals our interior systems, its visible condition is designed to describe their functional state. Likewise, our clothes in their myriad styles and colors both conceal and reveal our psychological states even when our thoughts, speech and actions might proclaim otherwise. But in a perfect world, the clothes we choose to wear would project not merely the public image we present (depending on our socioeconomic status), but would instead serve as ‘soul garments’ to reflect our inner character from the dynamic facets of our souls. In a superficial sense, they do so, but only if those who see us care to interpret our choices. “Through its recitation we thank G-d daily for enclothing us with the potential to do mitzvot, i.e. the ability to utilize the garments of the divine soul in a constructive and Jewish way. Each day we weave a finer and more exquisite garment of good thoughts, good words and good deeds, each person according to his capacity. When the soul leaves this world to reunite with its Source, it “wears” a garment woven from all of the positive thought, speech and action a person engaged in while alive. This blessing verbalizes our commitment to transform our mundane actions into a stepping-stone to our Creator by choosing to clothe ourselves in the garments of our Divine soul. Thus, “…who clothes the naked” can also be rendered: “…He that gives purpose to the purposeless,” and by saying this blessing, we thank G-d for investing our lives with meaning and direction.” This was all very interesting, but in order to create proper visuals for this blessing, I needed to know more about how these ideas evolved. Verse 3:20 in Bereshit/Genesis relates that our primeval ancestors had worn only their ‘birthday suits’ during their time in the Garden of Eden but when this phase in human development ended with their consuming fruit from the forbidden Tree of Knowledge, it also brought them realization of two truths; their own mortality and the ability to perceive their bodies and souls as separate entities where they were previously oblivious to such an idea. 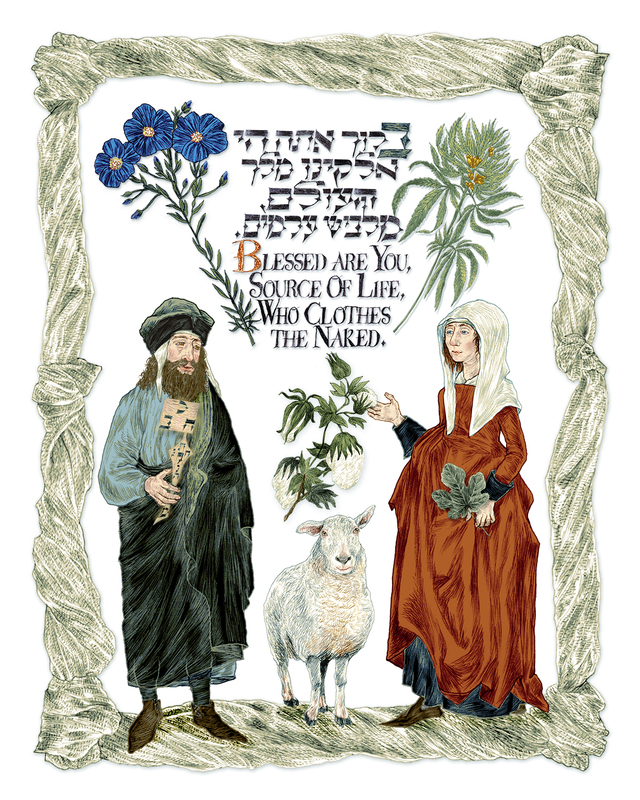 Although we are told poetically that Adam and Eve were then provided with a ‘garment of skins’ for protection from the mercurial elements beyond that ideal environment, no specific description of these garments is given until rabbinic commentaries (Midrash) to the Torah were composed in later centuries. Until beginning my research for this blessing, I had presumed with some distaste that ‘skins’ meant animal skins which would have required the death of another living creature. However, in a midrash called Pirkei D’Rabbi Eliezer (The Chapters of Rabbi Eliezer The Great), I read an intriguing explanation. It seems that when Adam and Eve were banished from Eden, the serpent who provoked their illicit behavior did not go unpunished. Knowing that Sammael, for that was the serpent’s name, could not die, he was painfully confined to boogie-ing on his belly and was made to shed his skin every seven years. It was from this ‘skin’ that garments were made to replace the fig leaves which Eve had hastily sewn together to wear as a sort of apron. Though I have not included a literal image of the serpent in my illustration, you might see a shadow of Sammael in the sinuous length of linen that frames it. As I drew this undulating form, I wondered whether his devious actions might have actually liberated Adam and Eve’s intelligence and enabled them to fashion their clothing from the skins of animals and natural plant fibers in their environment? This question led me to include a fig leaf image symbolizing Eve’s ingenious response to her newly mortal predicament. Though medieval art, architecture and fashion history color many of the illustrations in this book, the fashion aspect is especially relevant in this blessing because it visually epitomizes the tenets of tznius, or modesty in appearance. This custom of dressing encourages us to look past one’s clothes in order to appreciate the character and soul of the one wearing them. To illustrate this concept, I’ve placed a metaphorical object in the man’s hand. It is a construction of the Ten Sefirot (Divine Energies) in which the Hebrew letter ‘vav’, corresponding to the ‘vav’ in G -d’s name, hosts the other nine letters. It was inspired by my reading of Rabbi Yitzhak Ginsburgh’s complex essay,‘The Kabbalah of Nutrition’** in which he explains that while clothing protects us from the elements, it also represents our character traits making it a ‘prescription’ for a healthy body and soul that enables connection to our Creator. Finally, it is worth noting that in our contemporary scientific attempts to reconcile the significance of clothing with the message it projects, we have developed technologies to create ‘smart clothes’ that measure some of our vital signs to keep us informed of our physical condition. Still, this does not address the spiritual purpose of clothing; it is just a tiny beginning. We have a very long way to go if we are to understand how our clothing can teach us more about who and what we are, technology notwithstanding. Nevertheless, maintaining a certain mindfulness regarding Who provides for us and how we cover our bodies may one day inspire us to understand and perhaps re-experience the perfect world in which we were conceived. **The other ‘chukkim’ are explained on pp. 171 and 176 of Between Heaven & Earth: An Illuminated Torah Commentary (Pomegranate, 2009). Practical Matters 2: State Of The Arts-s-s-s? When the renowned French film director Jean Luc Godard said: “It’s not where you take things from—it’s where you take them to”, I’d like to think he was defending against what many consider the derivative nature of illustration, a presumption that an illustration may not stand alone as ‘fine’ art; it must derive from and serve a written text. Once, we were practitioners of an honored and well-rewarded profession which often entailed being a client’s ‘hired hand’. We identified as artists that proudly earned a living from our work, while suffering the derisive monikers ‘art whores’ and orphans of the fine art world from our more ‘noble’ but struggling artist acquaintances. However, since the early 1980’s, as studio employment quickly became history, we embraced our newfound freelance status and the value of personal expression in pursuit of market share and creative legitimacy. In fact, the publishing industry soon grew to expect illustration that exhibited ‘personal style’, the illustrator’s ‘brand’ if you will. Ironically, many illustrators became pegged to a particular ‘look’ which was and still is subject to trends, demanding periodic paradigm changes in order to remain competitive. This is a mixed blessing in a way, as it gives us the opportunity to continually re-invent ourselves and grow artistically and intellectually. Yet, with rare exception, has our work received the classical honors bestowed upon painters, sculptors or installation art scavengers by museum curators or self-described connoisseurs. And those rare exceptions generally occur within the walls of our professional societies and/or specialty museums with a single mission. You won’t catch an illustrator invited to exhibit at the Venice Biennale for example, unless he/she presents their work with some obscure title or statement of its raison d’être. Do the story-images we create really need to be labeled as ‘merely’ illustrative? Are the stories and messages we offer any less artful or poignant than their baroque-framed siblings? I don’t think so. In my opinion, the best editorial illustrators are those who infuse their own interpretation into an assigned work so that it not only illuminates the text it accompanies, but stands on its own as an intriguing artistic expression. Though photography has reshaped our playing field, it has also freed us from the need to be literal, so we may unabashedly draw and paint what we see and imagine with our considerable technical skills and our own brand of reality. Which makes me recall an odd little incident during a visit many years ago to Ohio State University, where one of my sons was a visual communications undergraduate. It was Parent’s Weekend and a tour of campus included a visit to the Fine Arts Building and chitchat with some of the professors. They proudly showed us the fully equipped painting and sculpture studios and ‘by the way’, here is our graphic arts department. It was a bare-bones room with chewed up old drafting tables, assorted tools and outdated textbooks. I didn’t think much of this discrepancy until we left the building in the wake of a break period in which students filed quickly onto the quadrangle. What struck me is not that I recognized the graphic arts students by the tracing pads, rapidograph pens and small t-squares they carried, but that in a lemming-like way, the ‘fine arts’ students and graphic arts students proceeded to assemble in two separate groups on opposite sides of a path that divided the quadrangle. For a school with 50,000 + students, it seemed rather provincial and led me to wonder what encouraged this odd behavior? Was it an unspoken directive of the professors, the university system itself, or a tangent of the art gallery/museum world informed by such sentiments as, practitioners of fine arts and illustration ought to be labeled and judged as two different species? Having taught at a major university and seen the same phenomenon occur there (not encouraged by me! ), I wistfully wonder whether all artists and the institutions that train and educate us, will one day come to realize how much more we can learn from each other instead of wasting time and energy building and maintaining invisible barriers that separate and define us throughout our creative lives. Like the universal language of music that soothes and nurtures our souls, art is and should be understood as non-denominational and essential to our very survival. 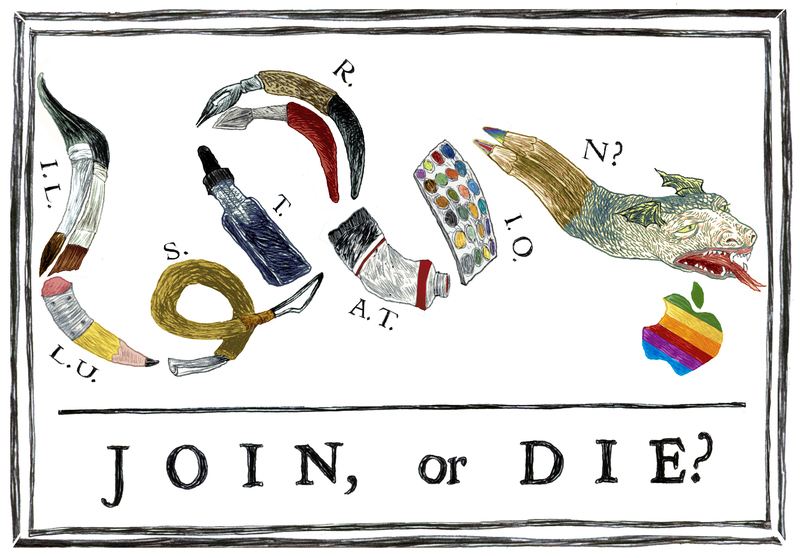 Note: For the curious who want to know: my illustration was inspired by Benjamin Franklin’s 1754 political broadside. Each time we read the Book of Exodus in anticipation of the vivid and timeless struggle between dualities that comprise and compromise humanity, we rediscover a story that never disappoints. 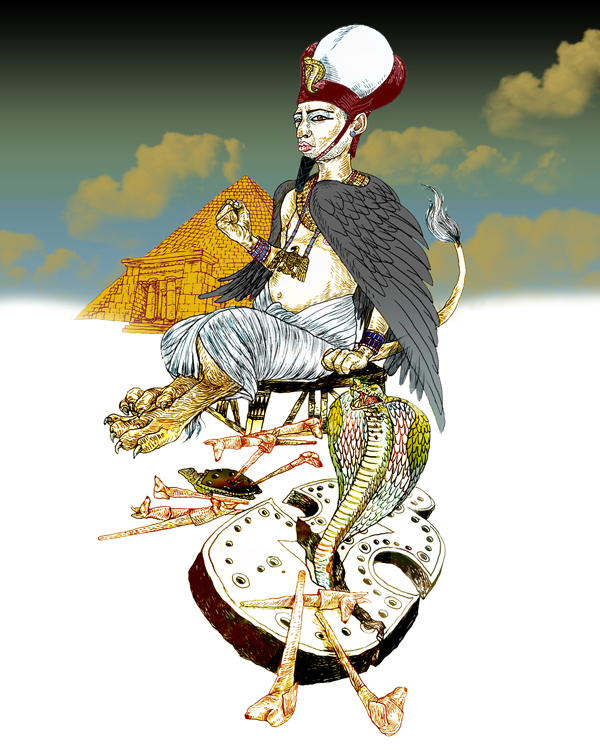 Pharaoh, the story’s antagonist is portrayed as the embodiment of evil, on a mission to maintain his royal status quo while Moses presents as the good man leading his people forth on a mission from God. Though each player in this game of morality and theology offers clever, strong arguments for their positions, the ultimate moderator is unseen, yet fearsomely present. Because the familiar tale of Israel’s long-suffering sojourn in Egypt has been interpreted and retold in myriad editions of the Passover Haggadah, I won’t be doing so now. Instead, along with the title of this post, I’ve decided to offer these images of Pharaoh, Moses and his brother Aaron as a visual prequel to the Haggadah’s traditional four questions. Perhaps they will provoke your own questions, challenge old concepts and reveal new facets of a story whose characters and threads continue to shape our ever-unfolding history. As ever, your thoughts are welcome here.